I have been very neglectful of late, but we tend to have busy lives and forget to pay attention to somethings. So I need to make it up. I have finished another block in the Gail Pan Berries and Bluebirds. I’m very happy with it. Redoing some of the berries has made the blocks look much better and I’m more happy with it. I spent sometime finishing a quilt as you go quilt that I hadn’t finished. I was very happy with it and it now is on my bed. 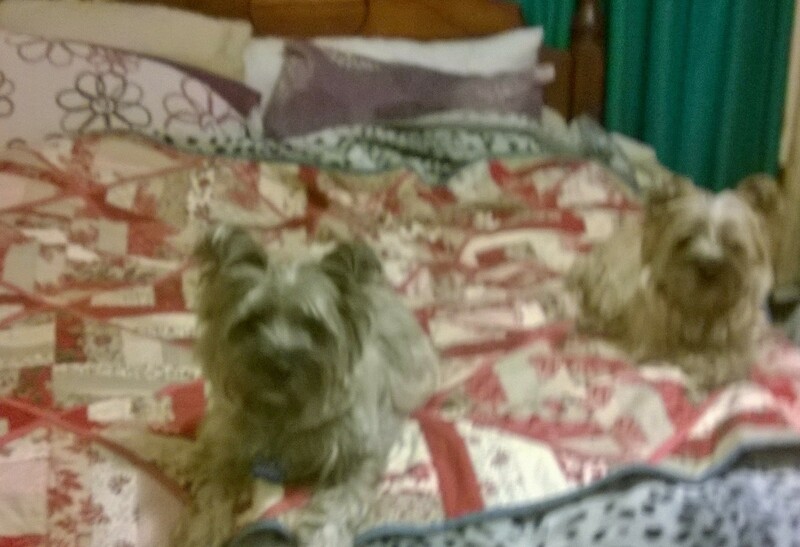 My puppies love this new quilt and when I can’t find them, I am sure to find them on the bed. I notice that a lot of animals tend to love quilts too. I have also been doing another quilt. Isn’t funny how when you use a pattern and make the quilt, you really don’t know how big it is until you put it on your bed. 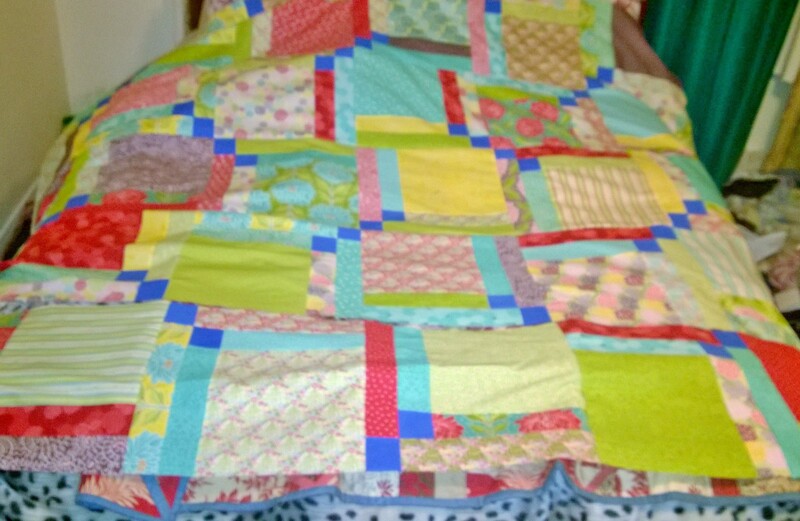 This quilt was to be 80″ by 94″ and it looks very big. I used the moda range Chantilly by Lauren and Jessica Jung with a royal blue used as a contrast colour. It was done using mainly a jelly roll and layer cake with very little scraps. 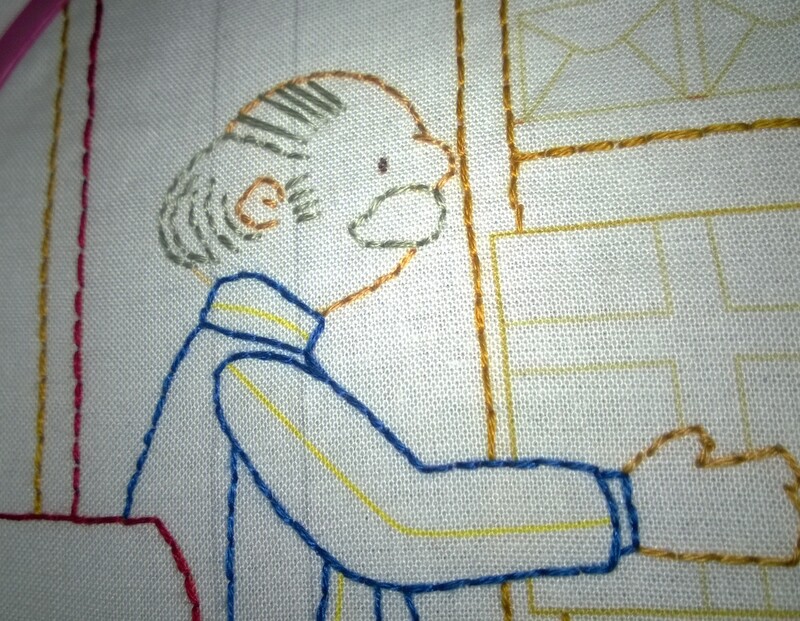 I have made it my son’s friend – hope they like it when it is finished. I also attended a day class with Helen Stubbing from Hugs ‘n’ Kisses and Rosaline Quinlan for their Stitching, through Sew Bright Alpine, at the Maze located at the Wandiligong Maze Café, located just 6kms from Bright. Lots of fun and a great day. 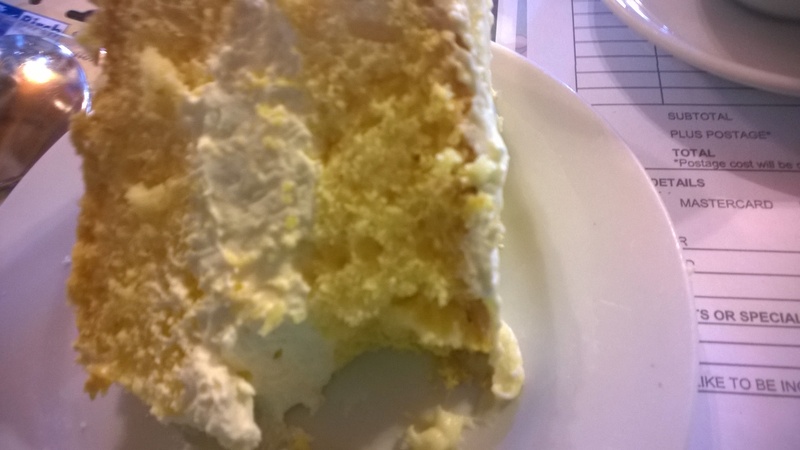 The sponge cake was huge. I also got a little look at Helen’s new book which looked very nice. Well I shall sign off for now and promise that I will keep you up to date with my going ons. I have been a little bit busy as have many other people I dare say. Well, my sewing machine has arrived back but due to the high temperatures (around 37°C and 42°C) I haven’t used it yet. The lovely people at the sewing machine centre told me it was a motor problem and it was replaced at no cost for me as the sewing machine was under warranty (a whole 5 years warranty!!!!). Although I have not done any machine sewing, I have been doing some hand sewing. I decided that I need to finish some items that I have, well lets just say it, put aside when something new came along. 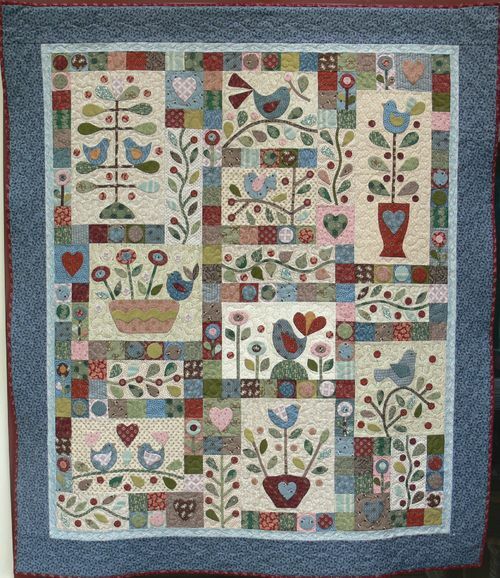 I am currently up to block 4 of Berries and Birds by Gail Pan Designs. I decided to do something different. 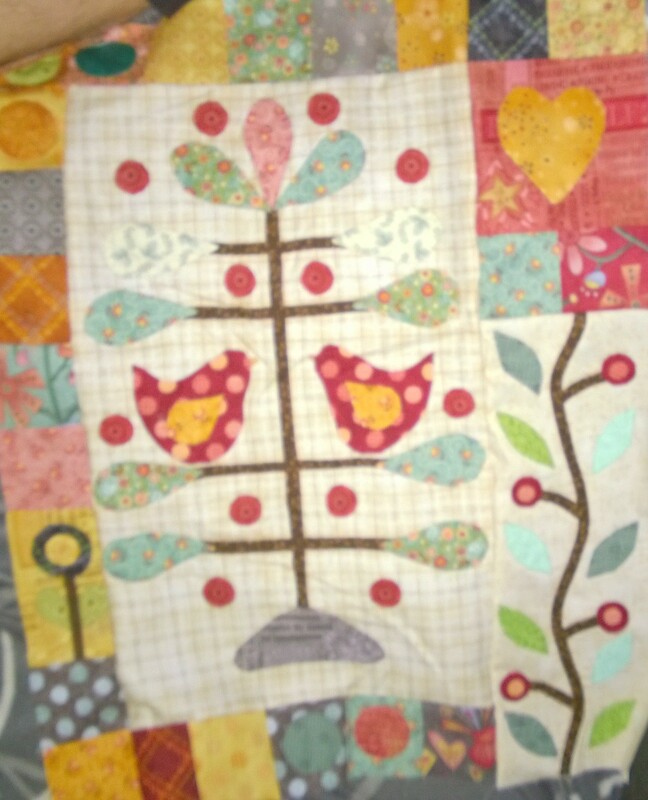 I have only done the applique blocks only with the intention of going back and complete each block completely. By photocopying out the patterns and laminating them, I have quickly developed my templates allowing for easy tracing and cutting out. 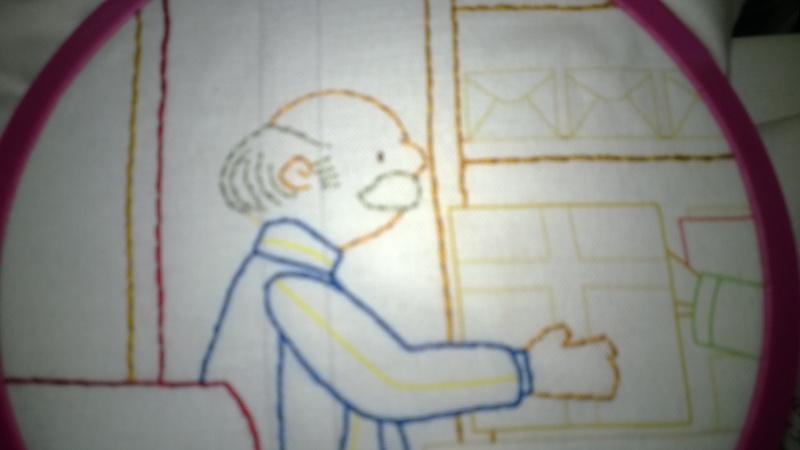 I have also been doing a stitchery which is preprinted. Its been a bit of a challenge due to the mistake in it. I am trying to incorporate a way to hide the fault in it. I think I have achieved it. 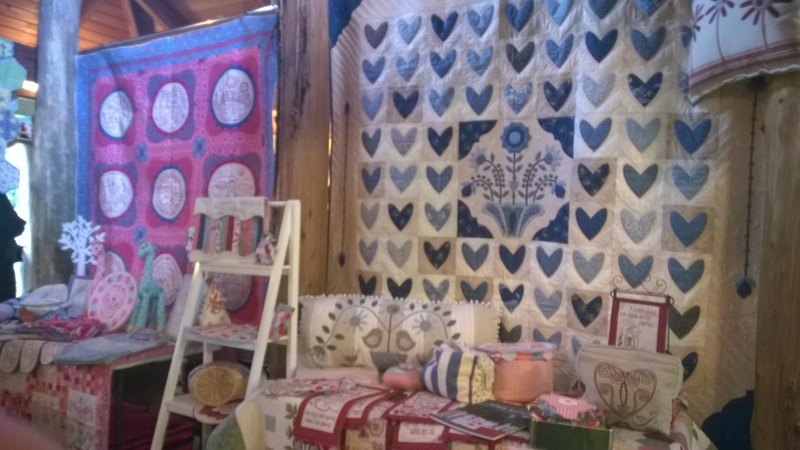 The quilt is called The Street by Smee Designs. What do you think so far??? I am still doing Cornelian by Hugs ‘n’ Kisses and have already brought more material to make a second one. 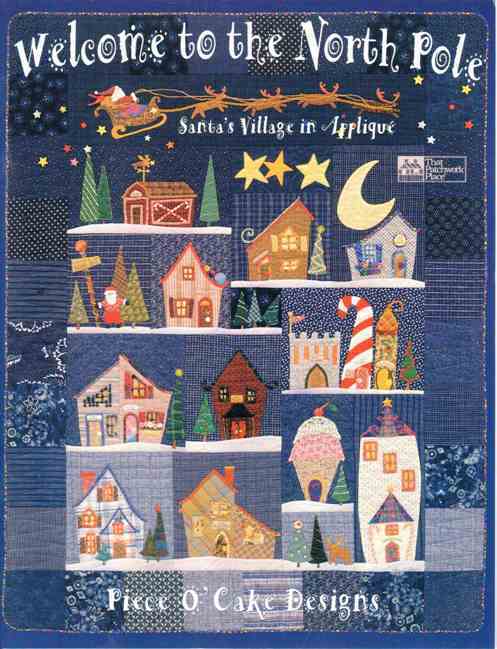 The quilt that I keep in my work bag is called Christmas Magic by Gail Pan Designs and I am just completing the stitchery before I do the sewing up part. Well, I hope you all had a very happy Christmas and a Safe New Years…. I have sent my sewing machine back to be repaired. 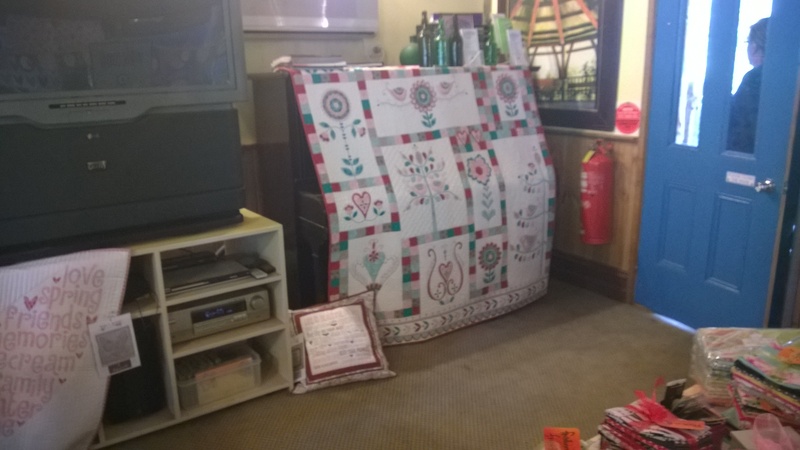 I’m hoping to have it returned soon, ready and will to perform my quilts. Currently I’m using my other machine which works ok but needs to have some fine tuning. Is anyone doing Hugs ‘n’ Kisses’ Cornelian? I’m currently doing it and have just started to put on the hexies on the first block. Of course it is French General range of fabrics and it looks very nice. 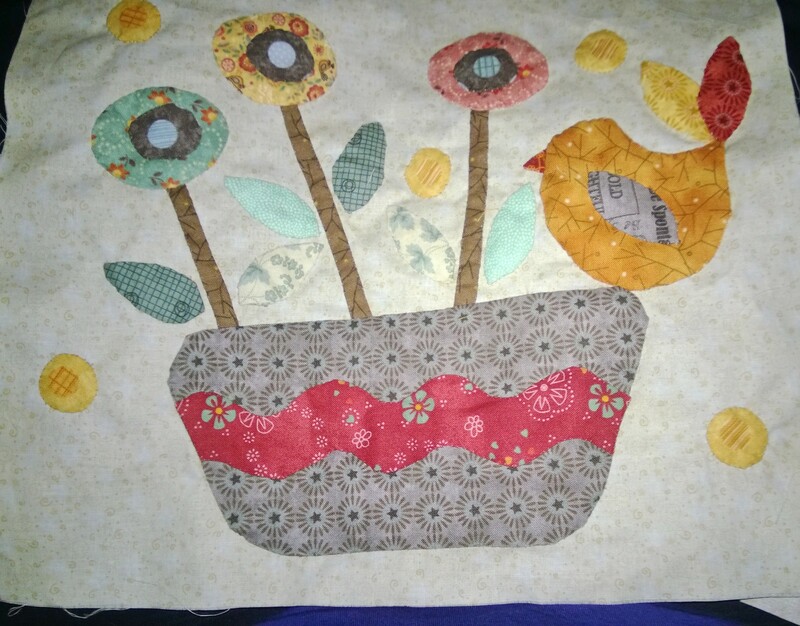 I got mine through Quilt Fabric Delights Creative and I love it. The kit uses the applique pre-cut paper which dissolve in water. 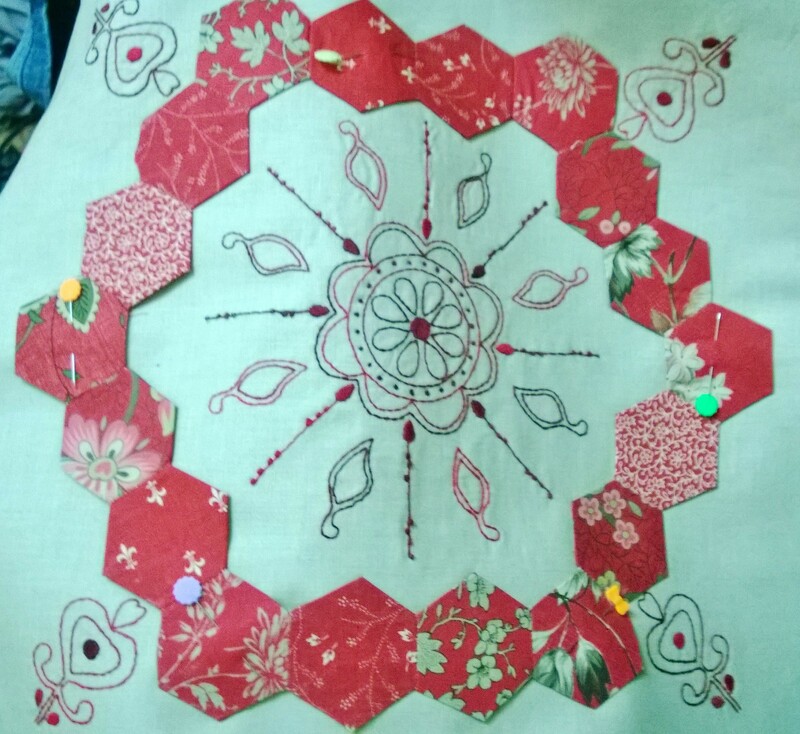 I’ve only just starting to do hexies, but this is really fun. Again, I am a little behind and have to catch up but that is fine. 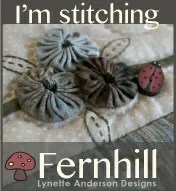 Since my studies have completed, I’ll be able to catch up with some of my quilt and get them finished. This is my biggest block for Twas the night before christmas. I’m sorry about the quality but it is a big piece and used the panaromic setting on my camera. As you can see the transfer had a line through it but it has faded after one wash so I’m hoping it will eventually disappear. I have alwaysl like the poem Twas the night before christmas. It takes me back to times when things were simple. I know there are a number of variations of the design but I like this one by Hugs ‘n Kisses. It basically uses two colors red and white. And I love the red cotton by DMC which is varigated. It is lovely. Well I have finished the blocks which I had to stitch. I was a bit upset with one of them as the pattern used iron-on transfers and it was very challenging to do and to make matters worst, one of the patterns had a unwanted line in it. But it is amazing that after one wash it started to lightened down. Hopefully it will disappear. I hope you enjoy what I have done .